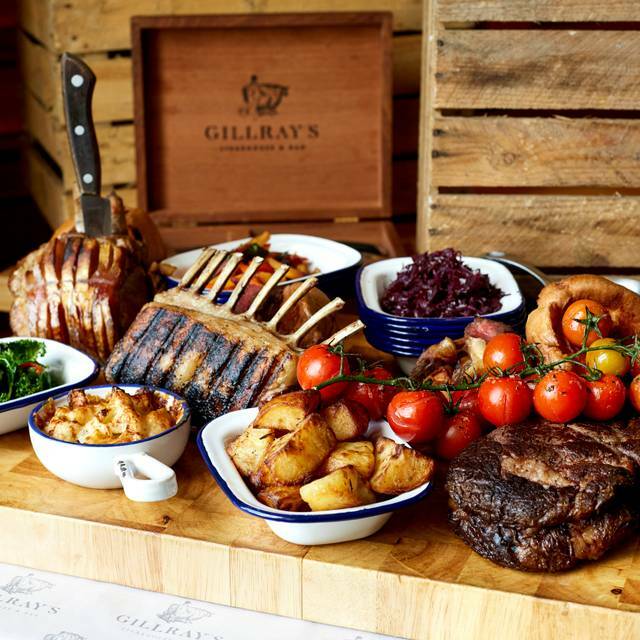 Gillray’s Steakhouse & Bar is the most English of English dining destinations. 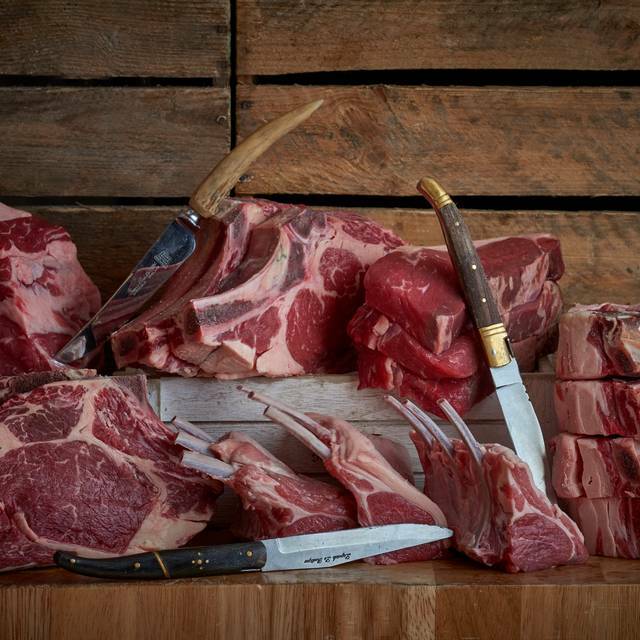 Set in the County Hall with views of the Houses of Parliament and Big Ben, Gillray’s Steakhouse & Bar is a homage to top quality beef from O'Sheas Butcher. You can also enjoy fish of the day, poultry, and local specialities. 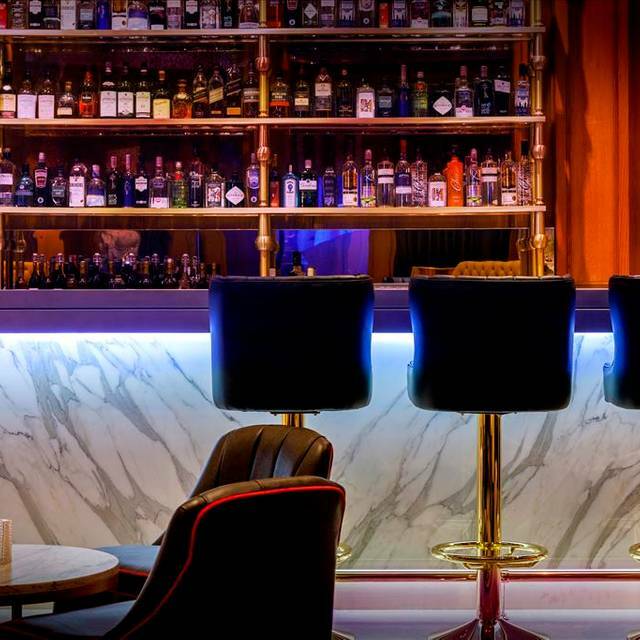 The Bar features a mouthwatering selection of over 90 gins and an impressive cocktail collection. 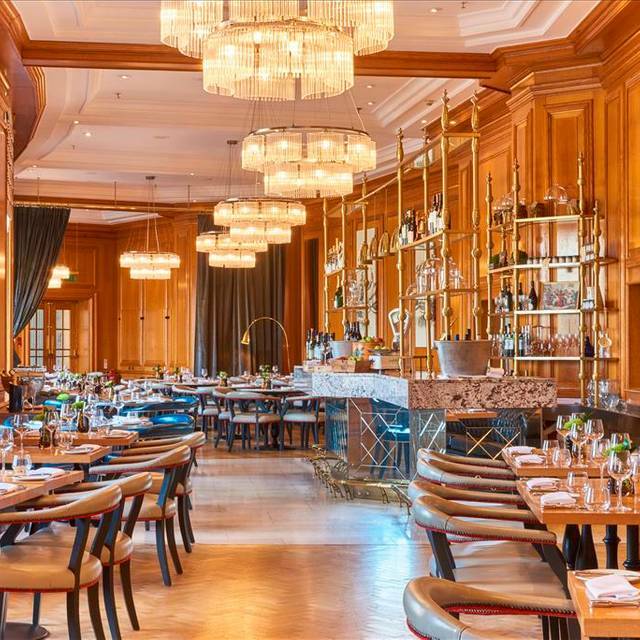 Toast the season with the introduction of a new quintessentially English menu in some of the most historic rooms within the former home to the Greater London Council. We opened our doors as The London Marriott Hotel, County Hall in 1998 and the building retains its original features to this day. Gillray's RoadKill New England I.P.A. Balvenie Doule Wood 12 Y.O. Available for children up to 12 years old, accompanied by an adult having a main dish and a side. Not available in conjunction with any other offers. 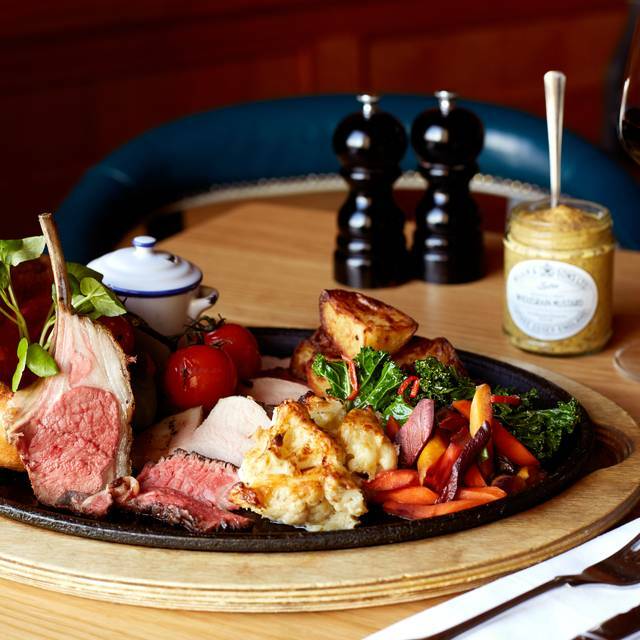 Sample a generous portion of 35 day dry aged beef rib eye roast! 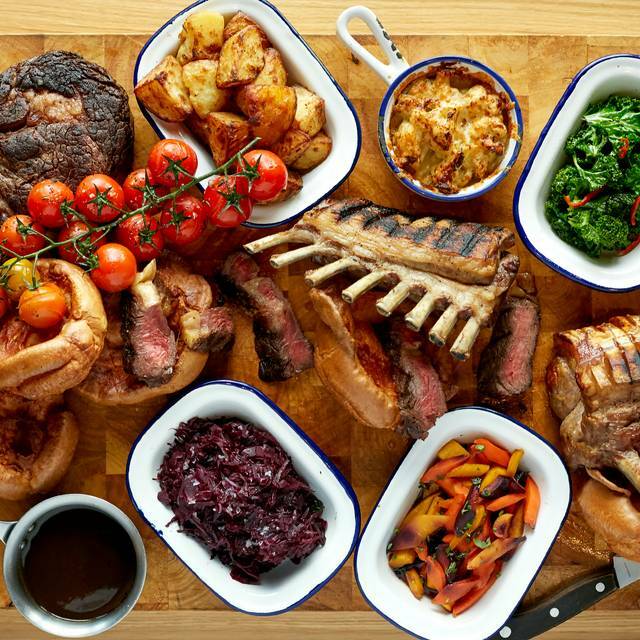 Available every Sunday so make it a regular tradition! Pair it with cauliflower cheese, roast potatoes, broccoli, maple glazed parsnips and yorkies and finish the weekend in style. From a set menu. Priced at £41 or £43 on a Saturday or Sunday. Terms and Conditions: Maximum of 4 diners. Includes Tax, excludes service. Includes a choice of cocktail between G&T and Bellini. This was our second meal at Gillray's during our week long stay at the Marriott. 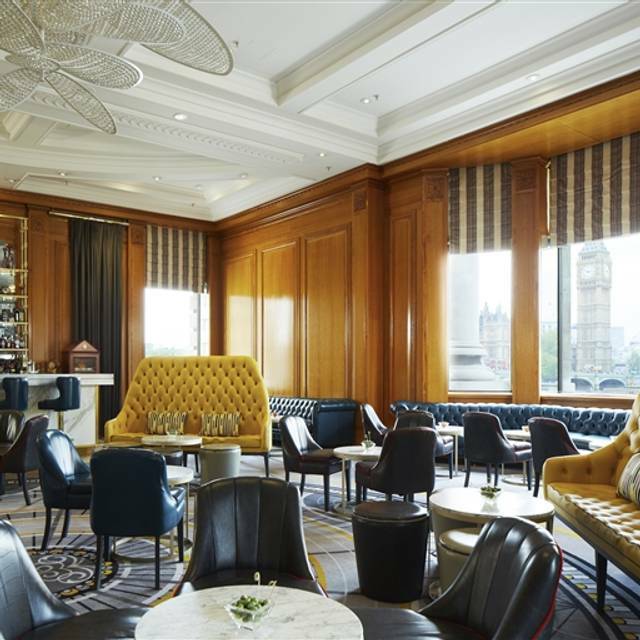 The ambience and service are very good, and who can't fail to love the views across the Thames? However, tonight my steak was stone cold and meals were slow to come from the kitchen. Our waiter was very apologetic and we were comped glasses of champagne and desserts, but, still cold steak is cold steak. I also think the choice of music might be more subtle. 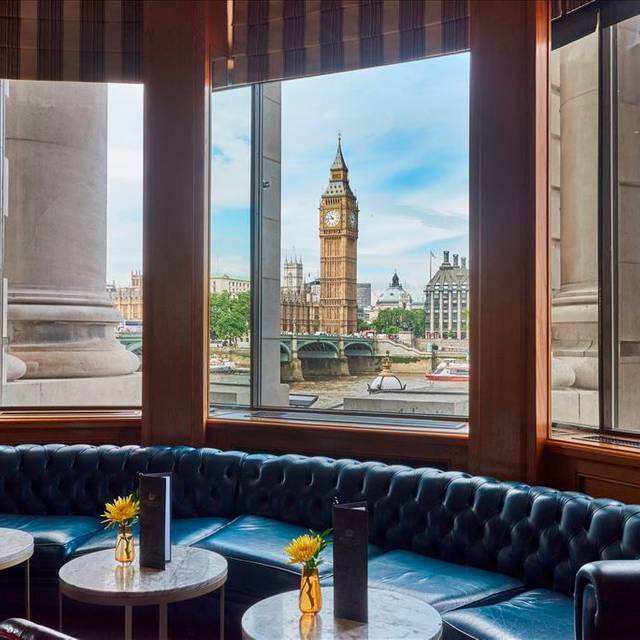 Beautifully appointed restaurant with views over the river to the Houses of Parliament. We had the three course set menu, and it had some interesting and tasty choices at a very reasonable price. An outstanding experience from food to service especially Silvia ,Anna and Andrea. Lovely meal. The staff were friendly. The view was great and the food was 5*. The music was a distraction some of the time. Would be good if they changed the menu more regularly and got rid of some of the less appealing ingredients. We did find chewing gum underneath the table top which was unexpected. I am a regular at Gillray's Steakhouse, and often entertain guests here when they are visiting London. They never fail to be impressed by the location, the décor, and the views. The food is always good, and the service is (usually) impeccable. The restaurant was experiencing some (uncharacteristic) issues on this particular evening, - but the waiting staff dealt with it professionally, and (without us asking or complaining) they knocked-off the cost of our side dishes and a couple of our drinks as an apology. This was appreciated, and has ensured I'll be back again soon. Definitely recommended. Very good service and value for money! Very relaxing - I was on my own, and the waiting team were helpful, attentive and charming. I am terrible with names, but I think it was Anne and her colleague especially. Mohammed the manager who looked after us made sure everything was as we wanted and our server was fantastic and quick. All staff were polite and very professional. Let's not forget the steak and oysters are to die for. Service terrible no food after 1 h and 20 minutes and we had to chase the waiter to get him to bring the bottle of wine we had ordered which came after 40 minutes we had been seated. This was a per-theatre dîner which we mentioned to our waiter as we were seated. Seeing that the food was not coming we chased twice. Each time the waiter told us the food would be there in 5 minutes. We had ordered flat iron steaks so nothing complex or slow to cook... we left without eating diner, frustrated and disappointed. This place is just terrible. The food on the whole was satisfactory, but the service certainly needs to improve. Long waits for everything. It's a pity such a nice restaurant, in a nice place, in a nice hotel, to make such mistakes with the service. The meat was delicious and correctly cooked BUT it came on our table COLD. The 3 out of 4 dishes. My wife and I were disapointed with out visit to Gillray's Steakhouse. We booked the pre-theatre menu but it doesn't have a steak on it so we looked at the al a'carte and chose a rump steak and the fish and chips. The fish chips were fine but the large steak was overcooked and very chewy. So we complained to the 'manager' as we had previously had a problem with our waitress understanding us - and with her knowledge of the menus! The 'manager' handled our complaint very well getting us a glass of champagne and offering another steak though warning it would take sometime. When it finally arrived it was still overcooked and it came without chips. Finally, the bill came which wasn't as expensive as it should have been thanks to a discount we were given. One of the waiters was french. Helped us a lot to understand the menu. Very classy restaurant in a very classy place. Really nice. Really lovely restaurant in a great location. We got the theatre deal which was such a good deal. Staff were all really nice, friendly and helpful. I want to go back when I have more time, and don't have to dash off to the theatre. We had a fixed price 3 course meal. The choices were very good, steak cooked perfectly. Very nice deserts. The lovely experience was tarnished by the adding of 12.5 per cent to our bill. When we paid we didn't have the odd 25p so rounded down. The staff came over and asked us in front of everyone for the 25p. A service charge is not compulsory but based on good service. Best fillet I have ever had! The food was absolutely superb! Meal took nearly 3 hours due to painfully slow service even though there were several empty tables behind us. The steaks were paper thin (1/4 inch for a rib eye - no kidding) and cooked to shoe leather done-ness even after asking for medium rare. The "manager" when asked about the steaks and long wait was rude and pompous...after long discussion he dropped the charge for two of our meals. We witnessed him "negotiating" with at least two other tables for similar problems. It seemed to be a regular occurrence that they just accept as normal. The staff obviously don't respect the manager. It was visible. Could be a great place with skilled management. Alas, that is missing. The appetizers and non-steak items were very good. The chef can cook. I think if the chef had better ingredients (steaks), and if the front-of-house management was replaced it could be a good place. 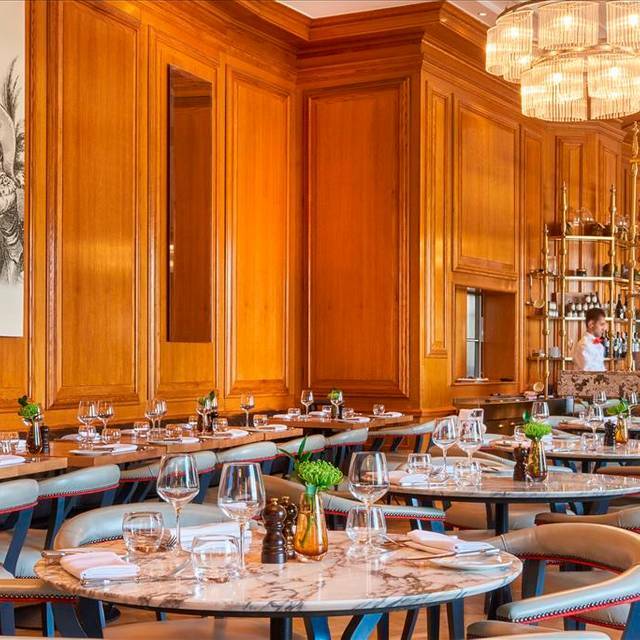 The hotel that Gillray's is in is fabulous and this restaurant is damaging the hotels reputation in my opinion. Too bad. Really no class place. Weather in service, food and anything else. Service late and unprofessional. The lunch deal is well worth it at only £15 for the steak and chips. Great service (haven’t been to a restaurant yet that let’s you select a steak knife!). It was a little hard to find but once in the restaurant was nice with a lovely view. We went for the set menu which when I booked said it included either a G&T or a bellini but when we arrived we were told it was either sparkling wine or a bellini which was a bit disappointing. It seemed to take too long for them to take our orders and then we found out only when we ordered that one of the starter options wasn't available. However the pate starter was delicious and presented beautifully so that was a plus. Mains were mixed - my fillet was delicious and beautifully cooked, while the risotto was, sadly, decidedly bland. Desserts took far, far too long. I opted for the bakewell tart which was way overcooked and I simply couldn't eat the pastry. Overall I would say the food was good for the price but the service was very poor - particularly as they weren't overly busy. If this and the desserts could be improved I would go again. We booked the pre-theatre menu which is good value and comes with a cocktail. Having read the reviews we made sure to book early which was fortunate as a very large Christmas party arrived a little after we did. Service was good though other tables had to leave before their main course - possibly returning after the theatre to finish. The room was busy with later afternoon tea being served so quite noisy but the view of the river made up for that. Buen servicio, pésima calidad de alimentos. Eh. If this is the best beef that England has to offer, as the description states at the time of this review, then I recommend the fish. First visit and will be the last. Our reservation was for 8.00 24 November 2018. When we arrived we were shown to our table the lady was not very polite no one explained the menu nor were we told there would be a delay on food. Half an hour passed still no food still no explanation. Took at least 40 minutes before someone apologized and brought us complimentary bread 3 small pieces for 2 people which they should have done in the first place. It was over an hour before we got our food and it was OK not amazing. Sides very small ordered spinach very overpowered by chili. Also my husband ordered a Gin and Tonic took 15 minutes for this to arrive. We did get 20% of the payment but unfortunately it was a little late. This could have been sorted from the start they could have informed us straight away and maybe brought the bread out earlier and maybe a complimentary drink would have helped. I was not the only one complaining do not expect such bad service from any restaurant. Its a shame because its a lovely restaurant inside very decadent just the service and staff let it down. Food took forever to be served with poor excuses. Even had to ask for wine as waited for that also. This was such a treat. We had the most delicious filet mignon prepared perfectly. The food was outstanding and so was the service. Great ambiance. Highly recommend. We will return. One of the worst dining experiences I’ve had. Bad food. Staff were quite nice, though.